Even though everybody keeps telling you that your wedding day is all about you and your spouse-to-be, that’s only mostly true. It’s also about the people who show up to celebrate you — after all, what’s a wedding without any guests? It’s important to consider what wedding guests want on your big day, too. To show them how much you appreciate them coming to your soiree, put in some extra effort to include some totally guest-pleasing elements. Here are a few that will wow your loved ones (and leave them talking about your wedding long after it’s over). Since food trucks are so trendy (and in some cities, hard to come by) the novelty adds a little oomph to your menu. Plus, food truck fare is always fun, whether it’s gourmet french fries, waffles or ice cream cones. And there are plenty of ways to pull it off — maybe the truck shows up just during cocktail hour, during the dance party, or to serve dinner if you’re having a more casual affair. Photo booths have basically become a staple at weddings — and we love it! They’re so fun for every guest, and they give everyone something to do when they need a quick break from dancing. You can totally customize a photo booth with props, backdrops, and more — so whatever your wedding style, it’ll fit in! Photo booths also work for any budget because you can do a DIY style where guests take their own photos, or you can hire a pro. Either way, guests go home with an extra little souvenir! Read why we still love photo booths! Nothing puts a damper on the mood like a too-long, too-awkward, or too-anything toast. But a really great speech? That can send your wedding to the next level. Of course, brides and grooms don’t have much control over what their parents or honor attendants say…but you can, at the very least, ask them to keep their speeches short, lively, and lighthearted (and only a tad sappy). Want to get guests out of their seats? Easy — just play the classics! They can be old school favorites (like “Shout!” or “Brown Eyed Girl”) or popular, upbeat hits (like “Shut Up And Dance” or “Uptown Funk”). Avoid songs people won’t know the words to, and save the modern tunes (like Beyonce and anything by anyone whose name includes “DJ”) for later in the night, when grandma’s already in bed. Oh, and don’t forget to play a mix of upbeat and more mellow songs — everyone wants at least one slow dance! 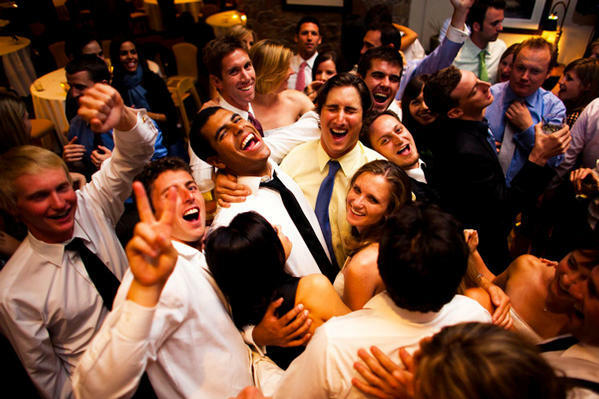 Speaking of getting guests on the dance floor…they’re going to get hungry real fast if they’re dancing their butts off. Keep them well fed — and on the dance floor longer — with a “midnight snack.” Finger foods that they can eat while dancing are always a big hit (and who doesn’t love mini snacks?). You could also order pizzas, burgers, ice cream, or anything else that’ll keep your guests energized. You don’t need to hire a whole dance troupe to come in and perform, but guests will swoon over a little something beyond the expected. A few ideas? Lawn games, out-of-the-ordinary guest books, and fireworks are a few favorites. Guests also love dance floor games, like the shoe game! No one says you have to put all of your cousins together. But you could put some of your cousins with a few of your spouse-to-be’s cousins of a similar age. That way, your guests get to meet new people but still have fun with people they know. Same goes for older guests. There’s no real rule on how to seat your nearest and dearest — just put some thought into it! Sometimes, going home from a wedding with yet another pint glass makes guests roll their eyes. Rather than giving them random stuff that’ll fill their junk drawers, offer something they’ll actually use and enjoy — snacks, drinks, and small plants do the trick. If you have lots of guests with kids, you’re by no means required to invite them. But if you do, those kids’ parents will absolutely adore you if you set up a kids’ table (complete with a kid-friendly menu) or even a babysitter at the venue to keep an eye on them. The parents will have so much more fun! Imagine going to a wedding and never even saying hello to the newlyweds. Frustrating! Don’t let your guests feel that way. While you don’t need to have a full-on catch-up session with every guest, make sure you at least say hi and thank you to everyone. A receiving line is the old-school ways to do this, but you could also walk from table to table.